Regular pipe inspection: it is important to have a clear picture of how your compete plumbing is. This helps you in identifying any arising complication and acting on them before they turn out to be disastrous. For example, if you see that your water pressure has decreased, it can signify that a leak is out there, maybe at the tank or pipes. Problem detection is number one in preventing emergencies. Be familiar where shut-off valves are situated: any home has a kitchen sink, water heater and tank shut-off valves. You should know where all these shut-off valves are located, and more especially where the main shut-off valve is. This will be of help when there occurs an emergency like a major leak in which you are supposed to shut off the valve for repairs to happen. Always, have a sump pump if you live in a home with basement. The importance of this pump is removing any excess water that remains stagnant at the basement. On contrary, if you leave this water to be there, it will be absorbed by the floor and walls causing them to crack. Update the complete system. Everything has its time span of functionality, so is the plumbing system of your home. Updating the system will increase the durability and avoiding frequent emergencies. 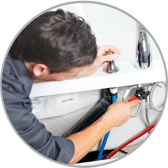 Opt for a Professional Plumber in Queen Creek when you can’t handle some major repairs: major plumbing repairs are very dangerous to be repaired by yourself. You may find that in trying to repair, you will be doing more harm, more so if the system is complicated. In such occasions, always contact qualified plumbers. In short, it is important to follow simple instructions like not flushing anything in toilets, not to fix issues when you have no idea, and carrying system inspections frequently.